Measure run-time (time-of-use) of equipment with the CSV-A8 split-core AC current sensor alogn with a compatible HOBO Data Logger. 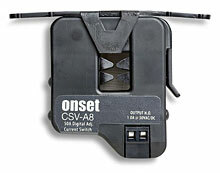 This UL-listed sensor has built-in on/off status lights and provides an adjustable current threshold of .5 to 175 amps. Simply install the sensor around a current-carrying wire to the equipment to be monitored and then connect the sensor to a compatible UX90 or UX120 data logger.